These silver-skinned fish have firm, rich flesh. Packed with nutritious omega-3 fatty acids, mackerel is a healthful, delicious option for a quick weeknight dinner. The firm, creamy-fleshed fish is simple to prepare and rather inexpensive to boot. Both mackerel fillets and whole fish cook up crisp and quick in the oven. If you're using whole fish, make sure they're cleaned and gutted before you cook them. Thaw frozen mackerel completely before cooking. Line a baking sheet with parchment paper and brush it with olive oil. Lay mackerel fillets skin side up on the parchment-lined baking sheet. If you're using whole mackerel, lay the entire fish on the lined baking sheet. Brush the upward-facing mackerel skin with olive oil and sprinkle with salt and pepper. Choose aromatics that complement the fish and side dishes, then arrange them on the baking pan around the fish. Select whole peeled cloves of garlic, shallots or coarsely chopped onions. Hardy fresh herbs such as rosemary, bay leaves and thyme add flavor to the fish. 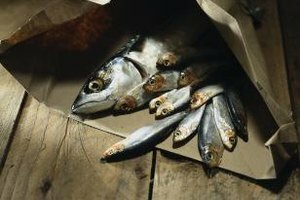 Nestle lemon slices underneath the mackerel fillets or inside whole mackerel to add a bright, citrus flavor to the dish. Roast the mackerel until it is cooked through and the skin is crispy, about 10 minutes for fillets and 20 minutes for a whole fish.